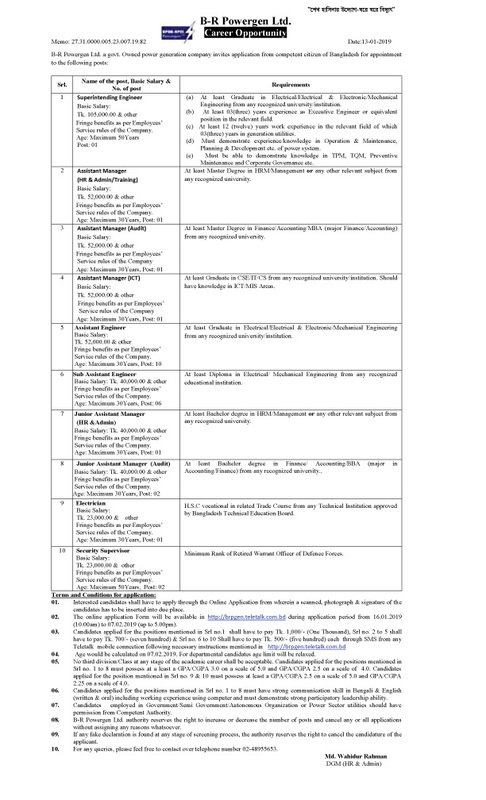 Bangladesh Power Development Board – BPDB Job Circular 2019 has published on Ittefaq Newspaper and their official website at www bpdb gov bd and www.brpgen.teletalk.com.bd. Bangladesh Bidyut Unnayan Board job circular 2019. BPDB will recruit some personnel for Freedom Fighter quota under this circular. Interested and eligible candidates must apply by 7 February 2019. Prescribe Application Form you can download from www bpdb gov bd and BPDB Head office Dhaka and Production Zone Chief Engineer office of Dhaka/Khulna / Chittagong / Mymenshing/Comilla/Sylhet as well as online application at http://brpgen.teletalk.com.bd. Bellow you have to see the job details and qualification to apply. Age limit : All the candidates age limit should 32 years up to 7 February 2019. But Divisional candidates age limit maximum 40 years. Candidates must face the written exam and viva for final selection. So you will get the Admit card, written exam seat plan. We will also update Bangladesh Power Development Board – BPDB Job written exam result via www bpdb gov bd. There are need to attach some documents with application form. You may check the list on the advertisement. If there is found any wrong information on application from the candidates will be rejected as well. Bangladesh Bidyut Unnayan Board job circular 2019.
bpdb job circular 2017. www bpdb gov bd. bpdb. bpdb gov bd. Bangladesh power development board job circular 2017. www bpdb gov bd job application form 2017. palli bidyut job circular 2017. bpdb job circular. www bpdb gov bd job circular 2017. www bpdb gov com. pdb job circular 2017. www bpdb gov bd job circular. pdb circular 2017. bangladesh bidyut unnayan board job circular. bangladesh bidyut unnayan board. www bpdb gov bd job application form 2016. bangladesh power development board. pdb bd. BPDB JOB SURCULAR 2017. www bpdb gov bd application form. Asst Accounts er jonno written xm ki Commerce related questions hoba? any idea…. 500 taka somo-muller oferot joggo crossed postal order kivabe pabo? 500 taka kothay joma dibo? Ai post ar moddhe e to application download link ase.